We left Las Vegas before first light, passed the Las Vegas Speedway as they were getting ready for a NASCAR event, and headed for the Virgin River Gorge on the border of Arizona and Nevada along Interstate 15. 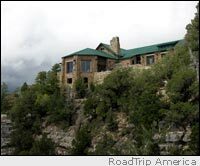 We were following our own advice and driving to the North Rim of the Grand Canyon without making reservations, trusting in our good luck to find an open room either in the lodge or in one of the cabins. As is our custom on such unplanned journeys, we stopped by a grocery store deli in Hurricane, Utah, to pick up fixings for that day's lunch. Eating out of a cooler at midday makes it easier to explore back country roads that are often away from towns and cities. The skies were full of storm clouds that promised rain as we headed south on Utah state route 59 (which turns into AZ route 389) and made our way past the small towns of Colorado City, Cane Beds, and Freedonia. As we drove south along the Kaibab Plateau, we passed an active wildfire being fought alongside route 67 just north of the Grand Canyon National Park. While the situation looked pretty tame as we drove along the still-smoldering trees and brush, we learned that the road had been closed a few times the previous day. Later, while we were gazing at canyon views from the North Rim, a fierce windstorm arose and several trees fell and blocked the road until fire crews could arrive and reopen the road with chainsaws. A bit of luck came our way at the park entrance kiosk, where the ranger informed us that the computers were down and entry to the park was "free." Alas, there was "no room at the inn." But the views from the north rim were fantastic -- the light kept changing as some of the storm clouds moved in and around the canyon. In fact, the fires were one of the reasons that the lodge was full. Just as I was speaking with the reservation staff, a request came in to "hold all available rooms" for NPS staff working the fires. I mused that during my years as Federal wild land firefighter for the US Forest Service I was never afforded lodging at a historic lodge while on an assignment. And I doubt that the hot shot crews I saw working the fire lines were getting those choice accommodations. Leaving the North Rim, we headed north again on route 87, wondering at the plethora of freshly cut tree stumps lying beside the road, (which hadn't been there when passed by the first time) and headed for Kanab, Utah. Since Kanab is only a few miles from three national parks (Bryce Canyon, Zion, Grand Canyon) and a whole bunch of state parks and national monuments (Lake Powell, Kodachrome Basin, Coral Pink Sand Dunes, Pipe Springs, Cedar Breaks, and the Grand Staircase-Escalante National Monument) we knew we were just starting a truly memorable fall roadtrip. The next morning, after securing some incredibly tasty coffee from Willow Canyon Outdoor Company, we headed north on US-89 intending to make our way to Bryce National Park. Zooming along we passed a sign for the Coral Pink Sand Dunes State Park and then a few miles farther north another one. Our long-adopted on-the-road rule of highway engagement, states that "if a place calls to us more than once, we must check it out". So, backtracking a bit we headed south on Sand Dunes Road. The color of sand at this place is really exceptional and the constantly shifting rain clouds created amazing shadows on the dunes. Truly a cool discovery. Returning to US-89, we headed north through the towns of Glendale, Long Valley, and Hatch and turned east on UT-route 12. Every time I make this drive, I wonder if there isn't some sort of cosmic set designer at work. One moment, you're driving through sage brush and going up a gentle slope, and then bang! 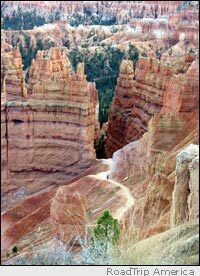 There are two red pillar-like cliffs, standing like sentinels at the entrance of Red Canyon. 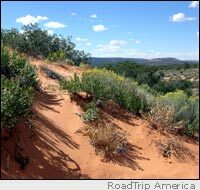 Red Canyon is administered by the Dixie National Forest and features one of the most amazing bike trails you are ever likely to see. The route, though visible from the highway, is separated from the road by several hundred yards and includes numerous suspension bridges spanning the wild streambed, which is often flowing with water. 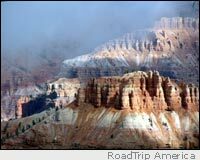 The canyon is a wonderful agglomeration of red rocks and improbable hoodoos, sandstone formations that have been eroded by wind and rain into remarkable shapes. The highway winds around the formations for about four miles before ascending to another relatively flat grassland plateau that marks the approach to Bryce Canyon. Apparently, not having learned anything from our experience at the North Rim lodge, we inquired about lodging at Bryce Canyon's lodge. Same result - no room at the inn. 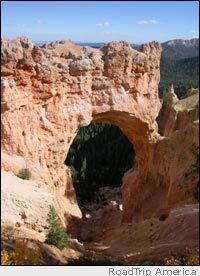 No worries, we headed south on the park road 63 headed for Rainbow Point and chased the sun, marveling at the stunning views at overlooks like Natural Bridge, (technically an arch), Aqua Canyon, Ponderosa Canyon, and Piracy Point. Retracing our route, we stopped at Sunset Point in time to watch the Bryce Amphitheater light-up with an incandescent glow from the setting sun's raking light. Vowing to return one day with sufficient time to go hiking, we returned to Highway 12 and headed for the charming small town of Tropic. The next morning, after an excellent breakfast at the Hungry Coyote restaurant, we headed back east on route 12 and found that it had snowed in the high country the previous night! White snow on red rock is stunningly beautiful, and although some dirt roads heading into the high country beckoned, we knew we wanted to visit Cedar Breaks on the way back to Las Vegas. 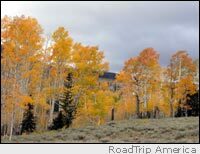 We pressed northward, back through Red Canyon and then south on US-89 to Panquitch where we picked up the Cedar Breaks Byway through the Markagunt Plateau. It was a brisk 26 degrees at the monument and the wood fireplace in the visitor's center was delightful. Somehow, my Teva sandals were not up to the challenge of facing the accompanying 35-mph brisk breeze for very long. Click here for a list of other Scenic RoadTrips taken by RTA. The twenty-mile stretch of highway 14 between Cedar Breaks and Cedar City was probably my favorite section of this road trip. The leaves were changing color in the high mountain meadows (about 9000 feet), and the red and yellow trees were glorious. Not quite ready to rejoin Interstate 15, we headed west on Highway 56 and turned south on Route 18. Shortly after leaving the farming town of Enterprise, we paused to look at the memorial of the Mountain Meadow Massacre site. A recent book by Sally Denton profiles the apparently unprovoked attack on a pioneer wagon train in September, 1857 by local Mormons and Paiute Indians. no room at the inn! In short, it was a perfect road trip!